Our 3 1/4 LED gimbal remodel kit in white requires a 3 1/4 size cut hole. The 18 degree adjustable gimbal trim includes an 8 Watt LED bulb that is dimming compatible. The combined junction box includes multiple knockouts for 3 branch wiring and quick connectors for easy electrical installation. The Halo RL4 Selectable Series is a complete LED Baffle-Trim Module that offers you the option of choosing your color temperature directly on the fixture. With the flick of a switch, you can choose between 5 color temperatures ranging from warm (2700K) to daylight (5000K) prior to installing into your compatible 4 in. aperture recessed housings (UL certified with Halo, All-Pro and more). This module is designed for use in new construction, remodel and retrofit installation and features an LED driver that offers 120-Volt dimming capability. The RL4 lens provides uniform illumination and wet location listing. The die-cast construction makes any housing AIR-TITE for added HVAC savings and code compliance. 3 1/4 Inch. 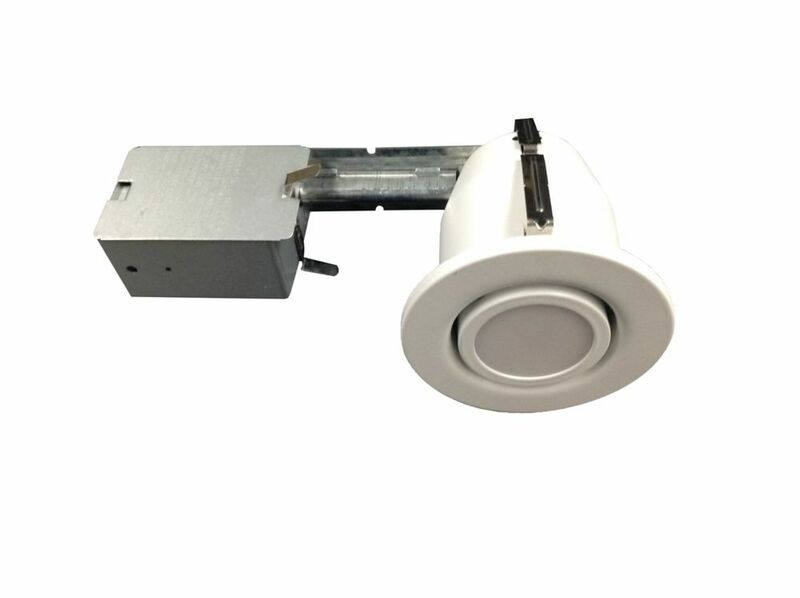 White Recessed LED Gimbal Kit Our 3 1/4 LED gimbal remodel kit in white requires a 3 1/4 size cut hole. The 18 degree adjustable gimbal trim includes an 8 Watt LED bulb that is dimming compatible. The combined junction box includes multiple knockouts for 3 branch wiring and quick connectors for easy electrical installation. 3 1/4 Inch. White Recessed LED Gimbal Kit is rated 1.0 out of 5 by 1. Rated 1 out of 5 by KARL from Started flickering Installed about 16 of these in my house. After a 1 year I've had to replace 3 already because the lights will start to flickering once they have been turn on for a few minutes. Not impressed. What is the lumen output and light angle/spread of the led? The claim is that they are dimmable, yet when connected to a LCD compatable dimmer, they produce extremely low lighting. &nbsp;Are they REALLY dimmable?